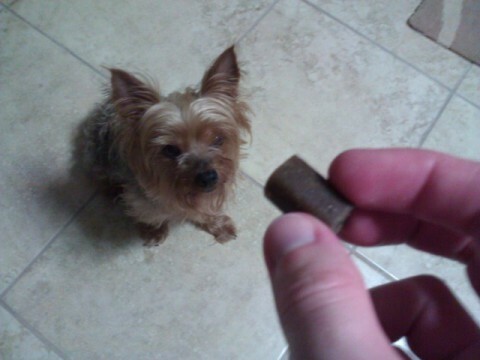 All natural ingredients, easily digestible, no filler, and your dog will actually want to eat it! 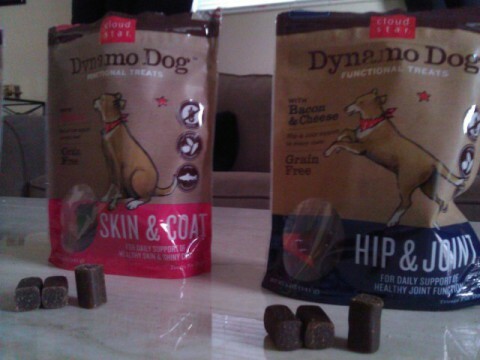 Scribbles and I were given peek at the entire line of Cloud Star’s Dynamo Dog treats, and we are more than impressed with the wholesome treats. Scribbles loves pumpkin! Who knew? 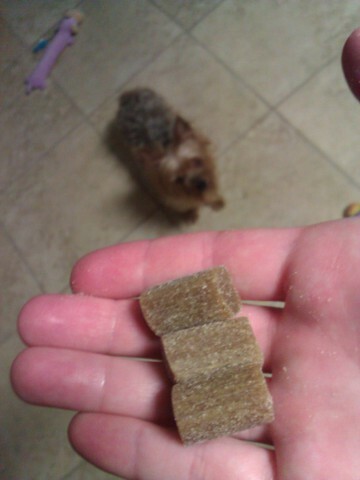 The treats themselves are a good reward for a small to medium sized dog, and while I could break them in half for Scribbles here, I’d rather her eat the extra calories since the old lady isn’t as interested in hard kibble to begin with. 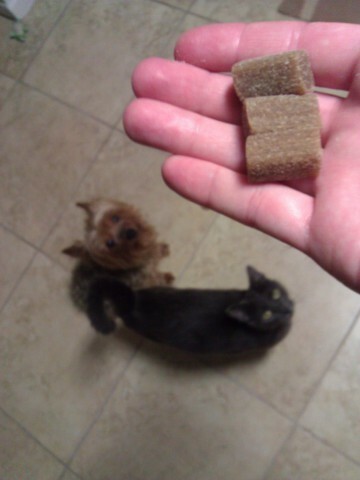 They don’t have that funky “dry pet food” stink, and each flavor easily passed her taste test. Scribbles is somewhat picky, and unlike many dogs, takes a “sniff test” before trying new food. (Note that I mean that she’d sniff test a chunk of your hot dog before wolfing it down!) 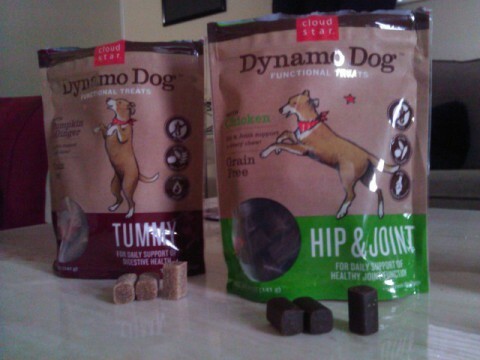 While I knew that she would love both types of Hip & Joint Dynamo Dog treats, (What dog wouldn’t love chicken and bacon/cheese? ), I was especially curious to see how she’d do with the salmon and pumpkin/ginger varieties. No, Joy- These are for Scribbles! The pumpkin and ginger seasoned snack was gone in an instant! If she was going to be picky, it would’ve been with the meatless pro-digestion flavor, but I’d push my luck with the salmon recipe, as I can’t remember if I’ve ever shared anything fishy with Scribbles in the past. It only took a moment’s hesitation before she happily scarfed down her salmon snack too. 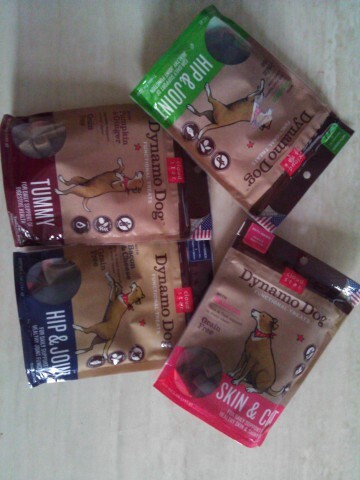 Considering that all four types of Dynamo Dog Functional treats are grain/gluten free (why does a carnivore need to eat wheat or corn anyway?! ), made with natural and hearty ingredients that you would consume yourself, made in the United States, and that they don’t contain any funky additives or byproducts, they are a welcome addition to Scribbles’ diet. With such an ultra-high quality treat that is a reward, nourishing snack and vitamin all in one, Scribbles is a dedicated Dynamo Dog.